After months in storage over winter, you'll need to flush your RV water system. Since you winterized your RV, when you take it out of storage you'll need to make sure the water system is clean for fresh water. Each task on your RV checklist for taking your RV out of storage is important and worth taking care of thoroughly. The point is to ensure a safe and enjoyable travel season. One system that will affect you the most is your RV water system since you will likely be using water from this source for drinking, cooking, cleaning, and bathing. If you stored your RV for the winter using antifreeze, you'll want to flush this out completely. The antifreeze recommended for RV water systems is entirely different than the antifreeze you put in your vehicle's radiator. Please note that the antifreeze used in your vehicle radiator is deadly to humans and animals, and should never be used in your RV water system. Basically, if you winterized your RV water system you'll need to undo that work. Here's how to flush your RV water system and get it ready for use again. This isn't as complicated as it sounds. Simply hook your clean water hose to your garden tap, or city water tap if you are at a campground. Connect the other end to your RV clean water intake connection. Open your gray tank and turn on all the faucets. Flush until the water runs and tastes clean. If you don't have your gray tank hooked to a sewer, you might want to either catch the outflow in buckets or direct it to a proper sewage/gutter/drainage outlet. Do the same with your holding tank. Turn the pump on and run several tank-fulls of water through it to flush any antifreeze completely out of the tank and pipes. If you have any residual antifreeze taste you can flush your system by adding a box of baking soda divided up between the various drains. Either sprinkle it directly and run some water or dissolve it and pour it down the drains. Let it sit for a couple hours. If you didn't store your RV with antifreeze, you may still need to clean your system. Mildews and molds can be deadly, especially some strains of black mold. Make sure you disinfect your entire water system. You can do this by adding one cup of liquid bleach for every 20-30 gallons of water. Flush this through your system and let it sit for a couple hours, but no more. Chlorine bleach can disintegrate synthetic seals if left for too long. Chlorine bleach is also highly effective in killing bacteria, molds, mildew, and viruses, so you can rest assured your system will be as clean as the water you run through it. Flush this thoroughly, then to help get rid of the chlorine taste, flush with the sodium bicarbonate (baking soda) solution. Most people like to flush their water before they leave for a trip just so they can enjoy their time away without having to do these chores. Many RVers have added water filters to their RV water system. During trips, you're safe to add a couple tablespoons of bleach to your holding tank water to keep it clean and drinkable. Alternative water purification solutions (powders or liquids) are also available through camping departments or online outlets. If you're boondocking you'll want to make sure you can keep your water fresh for several days, especially where it's hot. Water in dark spaces is the perfect environment for growing bacteria and mildew. If your water tastes funny, don't drink it. 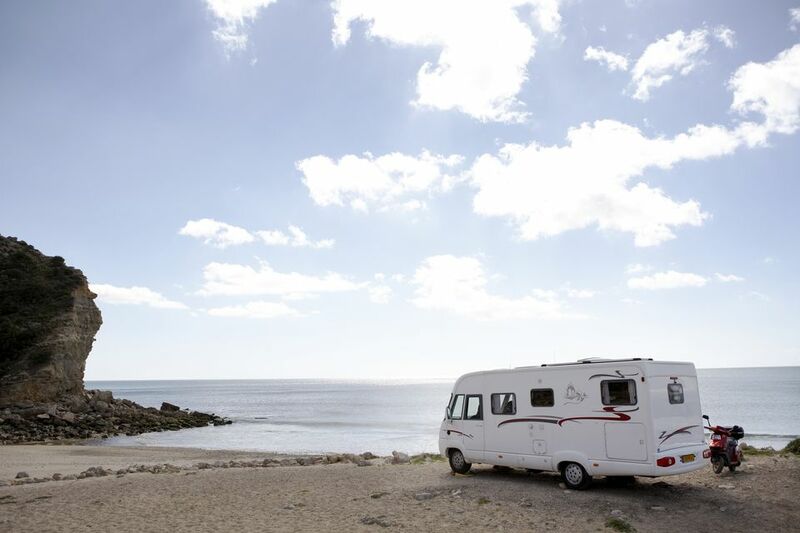 Drain your system completely when you return from your trip, and plan on repeating these steps after leaving your RV unused for more than a few days. Stale water rapidly becomes undrinkable water no matter how little there is. Dampness is all it takes. As a final step, make sure you have plenty of drinking water with you when you're traveling, RVing, or camping. You can break down at any time. Flat tires happen. The water might be shut off at the RV park for different reasons. If you're near a flooded area, you might find that your water sources are affected. If you're in an area that is suddenly affected by any disaster, you might find that supplies of bottled water become as scarce as fresh water. Whois the most reliable RV maker?